HMF have returned to Northwood, a national lettings firm with franchise sites across the UK, after originally fitting out their building as main contractor a few years ago. The original project involved fitting out mezzanine offices in a beautiful oak beamed listed building which involved high specification glazed partitioning and brushed stainless steel balustrading as well as the complete building works, mechanical and electrical installation. This time, HMF have come back and created a new gallery mezzanine area with matching balustrading and architectural lighting to create an additional office space linked to the main area. The existing mobile shelving that HMF originally provided for storing all of Northwood’s paperwork has also been extended. This work included uplifting an existing raised computer floor and then strengthening the area locally for additional guide rails to be set in at floor level to accommodate the new mobile bases. Once the guide rails had been fitted and the raised computer floor re-fitted around the guide rails, a new mobile base with hand crank was fitted to the guide rails to enable Northwood’s team to move the shelving backwards and forwards. The additional mobile shelving utilised was Dexion Sysco, a fully adjustable commercial office shelving system. It not only looks good but is also very easy to adjust and re-configure. The mobile shelving alleviates the need for space for access walkways to the shelving. Only one aisle is required therefore saving up to 40% of valuable office area. 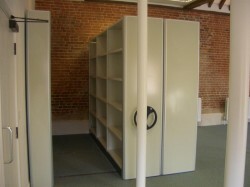 This expansion of the mobile shelving has created a significant amount of additional capacity in a very limited space. The project was competed on budget and on programme.